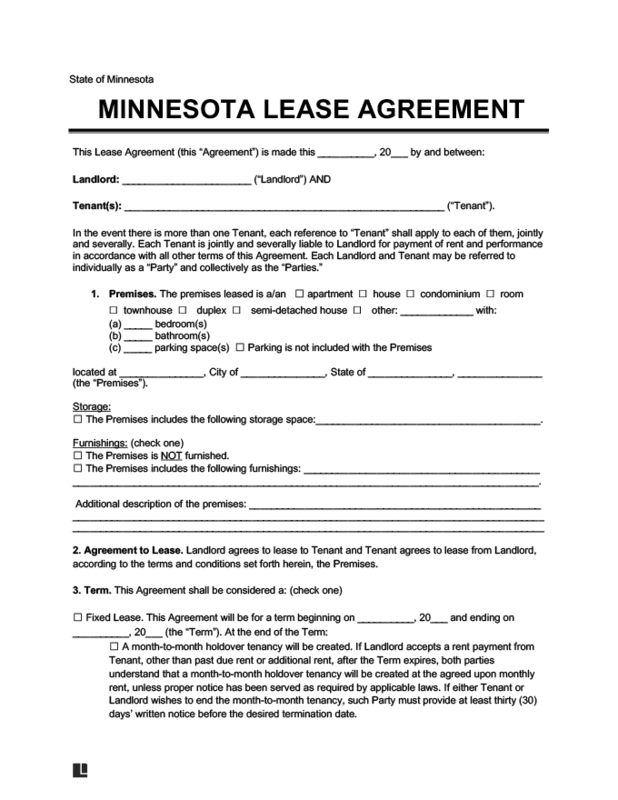 Use our attorney-drafted MN Lease Agreement form to finalize the renting out of your house, apartment, condo, basement or attic. Payment methods and deadlines for rent. States will often differ on key leasing and rental requirements. For example, some states may impose a security deposit be given to the landlord, while others don’t require a deposit at all. Acquainting yourself with your state’s specific leasing guidelines and distinctions will help better protect your legal and financial rights. Doing so now, will save you future hassle, and even a potential lawsuit in the future, so make sure you select the appropriate state where your Lease or Rental Agreement is to be executed to learn about the specific requirements and differences you need to be aware of.